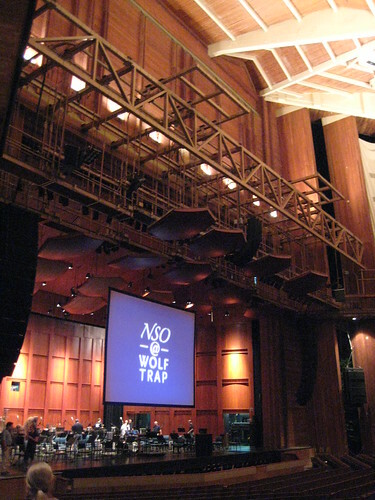 Wolf Trap is an amazing venue, specifically the Filene Center. I usually avoid 66 at all costs, but this venue is worth the drive. First, the venue itself is beautiful. A wooden open-air structure, not unlike Nissan Pavilion but small and more classy. The interior is lit by reflection off the white girders. Wood paneling and baffles are everywhere, but not blocking the view. Catwalks and lighting fixtures are exposed for all to see. The stage backdrop appears to be oak. It’s stunning. Second, they allow/encourage picnics on the lawn both before and during the event. Bring whatever you like. This is one of the few venues where you can bring in your own food and drink, including alcoholic beverages. So pack a grocery bag full of food. A couple of pizzas. A rolling cooler full of drinks. No kegs, but otherwise everything goes. The National Park Service maintains the grounds and buildings, and it shows. The field is immaculate. Despite nightly picnics, the grass is lush and green. I went out with friends last night to see The Wizard of Oz with score performed by the National Symphony Orchestra. We set up our picnic and shared a lot of food and deserts, enjoyed the wonderful weather and the open sky above. In addition to a lot of humorous lines in the movie that we never caught while growing up, we noticed that there’s a lot of music. There are only a few moments within the entire thing that there isn’t some sort of instrument being played, no doubt a rigorous exercise for the performers even with an intermission. There were many times when you forgot that the music was live, it was that well conducted and performed. I love the place too, but it is way to far away for a Baltimoron like me. I did see the Regenerator Tour with ABC and Berlin and the place was less than half full. Next month I have tickets to see Blondie and Pat Benatar. Should be a great show. yellojkt: It’s too far for weekend trips, for sure… but for special events I think it’s worth the stretch. Sounds like a good show indeed.